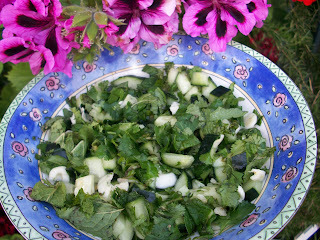 I came across this salad in an Iraqi-Jewish cookbook and was intrigued by it because I've never seen a salad which included raw garlic cloves as an ingredient.I was skeptical at first because of the amount of garlic used but after marinating it for the allotted time, which mellows the garlicky taste and tweaking some of the ingredients, the salad has a very cooling and refreshing taste and similar to the other salads of the Middle East. 1. Combine all ingredients together in a large bowl, mix together till evenly combined, and chill for about 1 hour.